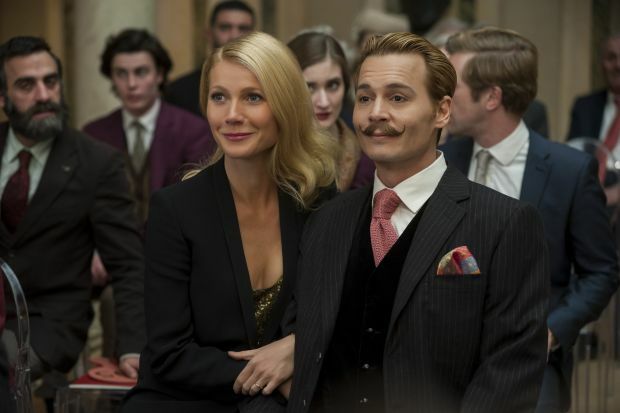 NEW YORK (CNS) — The action comedy “Mortdecai” (Lionsgate) tries to evoke the genius of British novelist P.G. Wodehouse while also conjuring up the sort of movies parodied by the “Austin Powers” series. But in place of the effervescent satiric champagne the film clearly attempts to supply, viewers get a gulp of flat ginger ale instead. Director David Koepp’s tone-deaf screen version of Kyril Bonfiglioli’s novel “Don’t Point That Thing at Me” centers on eccentric — and somewhat shady — English art dealer Charlie Mortdecai (Johnny Depp). While modeled, to some degree at least, on Wodehouse’s immortal upper-class dimwit Bertie Wooster, Mortdecai comes across as an annoyingly mannered ninny whose grating company grows less tolerable with every passing minute. At the behest of highly placed government spy Alistair Martland (Ewan McGregor) — with whom he shares a long-standing friendship more than a little tinged with rivalry — Mortdecai gets drawn into a murder investigation that eventually has him tracking a lost masterpiece by Spanish painter Francisco Goya. Since the hunt also finds Mortdecai fending off such threatening villains as international terrorist Emil (Jonny Pasvolsky) and Russian mobster Romanov (Ulrich Thomsen), it’s just as well that the easily flustered aristocrat can count on the back-up of his burly and resourceful bodyguard, Jock (Paul Bettany). He’s also aided by his devoted but not uncritical wife, Johanna (Gwyneth Paltrow). In a running joke characteristic of the movie’s feeble humor, Johanna spends much of the picture alienated from her spouse due to her intense dislike of his newly acquired moustache. Wodehouse could — and, if memory serves, did — make facial hair a source of amusing dispute between Wooster and his perennially correct manservant, Reginald Jeeves. In screenwriter Eric Aronson’s hands, by contrast, such inflated trivialities quickly wither. To Aronson’s credit, Mordecai and Johanna’s successful union — which seems strongly rooted enough to withstand not only the lip-foliage flap, but Alistair’s relentless flirtations as well — is front and center in his script. Yet even this positive aspect of an otherwise unappealing project is partially undermined by asides in the dialogue hinting that the absence of children from the couple’s family life has not come about accidentally. The film contains considerable bloodless violence, a brief premarital bedroom scene, frequent sexual and some scatological humor, including a vulgar anatomical sight gag, at least one use of profanity and occasional rough and crude language. The Catholic News Service classification is A-III — adults. The Motion Picture Association of America rating is R — restricted. Under 17 requires accompanying parent or adult guardian.